Key Action Realism - The way the keys move, the way they feel, their responsiveness to your finger pressure when you press down and let up on the keys, the material that is used to make the keys such as plastic partial wood, all-wood, are the keys individually weighted and/or balanced so that their weight matches a real acoustic piano, also how quiet they are when they move up & down. 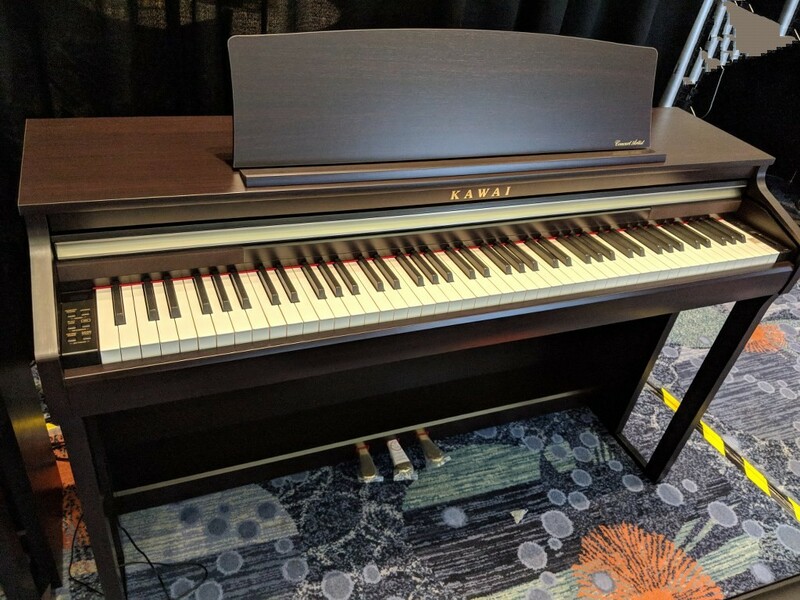 The new Kawai CA48 home furniture cabinet digital piano, which comes in simulated satin rosewood finish at a low $2099 internet discount selling price and satin black finish at a low $2199 internet discount selling price, is unique among its peers in its price range (under $2500) in a very special way. 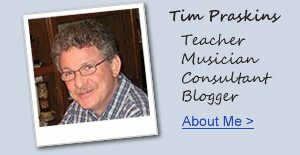 Before I get to that feature in this review, it is good to know that all digital piano companies think their piano is the "best" in a given price range....and why would they want you to believe any differently?! They tell you that their piano has the best key action, best and most realistic piano sound, best pedaling response, best functions and features, and the list goes on. 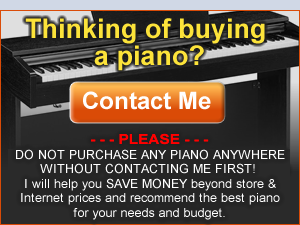 But I have been around long enough to know that this cannot be true because obviously not every piano can have the "best" in a given price range since as a piano shopper you may be looking for certain things in a piano that other pianos may not have, but that does not necessarily make one "better" than another...it is somewhat subjective. However, the one thing that generally is thought to be the most important thing in a piano, especially a digital piano, is key action. That is, how closely do the keys move and behave as compared to a real acoustic piano upright and/or grand piano keys in the way they feel when they move under your fingers? Are those keys easy or hard to press down, do they come back up quickly or slowly, or somewhere in-between? 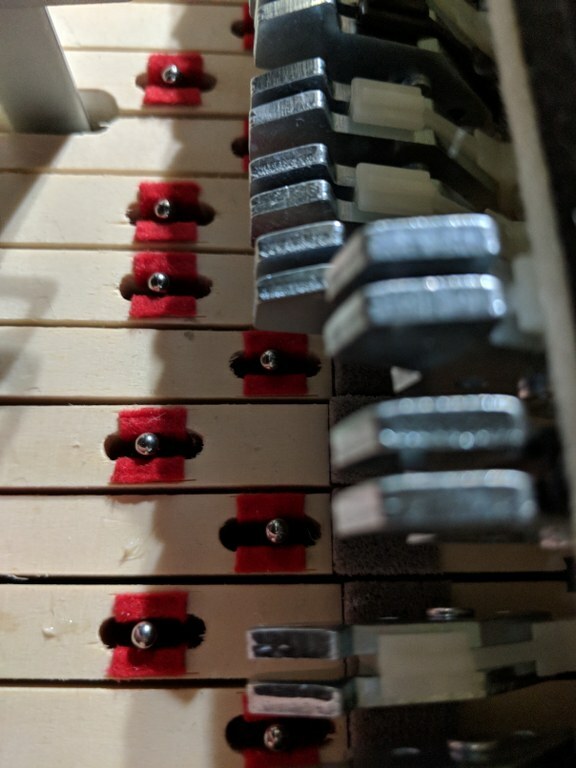 Do the keys wiggle or move laterally side to side a lot or are they tighter and more secure? Do the shorter black keys take a lot of extra pressure to push down, especially compared to the white keys, or are they have better balance and note transition. For a lot of people, key action noise is also an issue because most people don't want noisy keys especially when they are playing at lower volumes or using headphones? 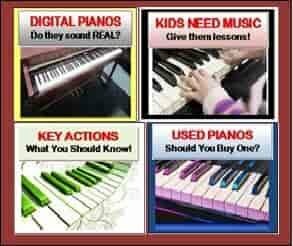 There are so many different reasons to want a digital piano piano. As a long time piano teacher, pro musician, composer, arranger, and consultant, among other things, in my opinion the #1 thing to look for in any piano, especially a digital piano...is, as I mentioned earlier, key action. 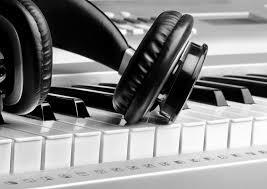 The piano key action is the one thing you cannot replace or change in the piano you will own. Piano sound and pedaling response definitely take a close 2nd place in things to be concerned about and people do want the best piano sound they can get for their price range. But key action realism and authenticity (movement & response of the keys) is the one big thing a piano shopper should be concerned about. When it comes to the key action in the CA48, it is the one and only digital piano in this $2000 price range that has authentic black & white all-wooden grand piano style keys for all 88-notes along with most ivory feel key-tops on the white keys and a smooth matte finish for the black keys which offers a better, smoother playing experience with your fingers. These keys are not just partially made out of wood or just have wooden sides to the keys like other digital piano brands, but have 100% wooden keys and you can even feel the actual wood as you depress a black key and run your fingers along the sides of the keys when you are playing...it's a very organic experience that I normally only get on real pianos when I am playing them. But having wooden keys is just the beginning of the process. Those keys also need to be designed in a way so that when they are installed, each key is independent of the key next to it so that when it moves it is isolated from all other keys just like in a real piano and each key weight inside the piano allows the key to respond as it would on a fine acoustic grand piano (see pic on left of actual CA48 interior keys& weights). The only real way to do this is to install those keys like they way they are installed in a real acoustic piano with a metal pin coming up from the keybed (the bottom of the keys) so that each key has a hole(s) strategically drilled through it near or at the center of that wooden key and then the key is slipped through the metal pin and secured in place so that it cannot move out of its position and is able to move in a see-saw type manner independent of all other keys. 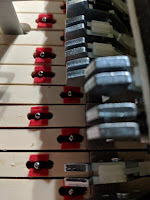 Balance pins are also installed so each key can have good balance from front to back and from white to black keys.This type of piano weighted and graded key action is a much more expensive process to offer in a digital piano and up until now the only company that has offered it in the past is this same company Kawai, but those pianos were priced starting at about $3500 discount price until the CA48 recently came out in this low price range. With the new 2019 CA48 priced at under $2200 and offering a real wooden key with real key construction and installation done at the Kawai factory, Kawai is now the only digital piano company that has this type of key movement under $3500 and there is no other digital piano company that comes close in this way. So that's the biggest selling point of the CA48 in my opinion...key action and how good it feels and responds. The keys move quietly, smoothly, with what I would call a "medium" weight to the keys in terms of static down-weight and up-weight which is the amount of pressure it takes for your fingers to press down the keys from a resting position and then have those keys come up and press back up against your fingers. In fact, the key-weight is so realistic in my opinion that it is much closer to a grand piano than an upright piano in terms of how those piano key actions feel when playing the keys. To add extra authenticity to this new wood key action which Kawai calls "Grand Feel Compact," Kawai also designed in to the key action a function called let-off (aka: escapement) which is a slight hesitation of notch that a person would feel from fingers when they press down any key somewhat slowly on a real grand piano about half-way down. 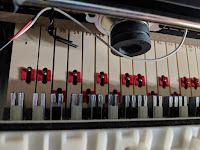 This type of thing can give a player more control over the music and just adds even more authenticity to the playing experience of the CA48...especially if you have played real acoustic grand pianos before as I have. 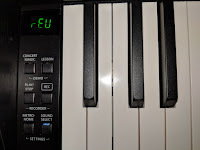 Some digital piano companies like Yamaha claim to have this "let-off" feature in their key actions but the Yamaha version is so subtle and light that it is nearly non-existent as far as feeling it really happen so it might as well not be there at all. However with the Kawai CA48 this grand piano let-off feature can definitely be felt in a natural way and although it is still a simulation, nevertheless it gives a player the impression you are actually playing a real acrostic grand piano, and for me, that's a good thing. I normally don't talk about key actions in my reviews quite this much but the CA48 key action is surprisingly so good and far outclasses anything else in this price range that I believe the subject is worth exploring in detail. Beyond the wooden keys, key weight, movement, let-off function, and installation process is the fact that this Grand-Feel Compact key action has 3 electronic key sensors under each key. Normally speaking when it comes to key actions that more sensors there are then the better the piano can sense your key movement and key travel and where the key is at any given time while you play. In reality a 3-sensor key action helps with having more precise key repetition when playing at a faster rate with more complex music. 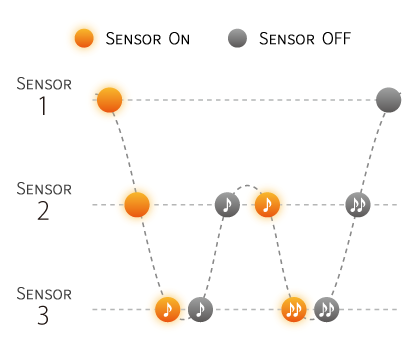 The extra sensor (many digital pianos have 2 key sensors) picks up key repetition more precisely so your music will be replicated in a more natural way when it comes to playing the keys. Beyond the 3 sensor action, the CA48 also has counter-weights in the bass keys of the piano. 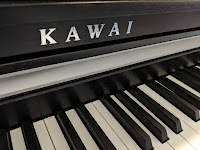 The lower bass keys in a piano tend to be heavier than higher treble keys so Kawai has included specially designed counter-weights to help with the key movement so the key responds more quickly, comes back up more precisely when pressed down, and therefore your music becomes more expressive. 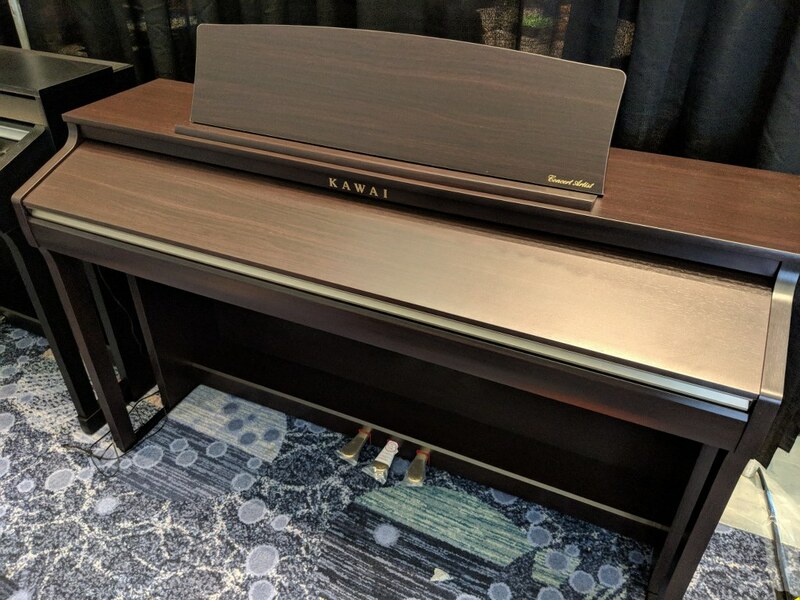 Most digital piano companies do not offer counter-weights in their keys so the Kawai company continues to innovate when it comes to their key actions. Another key action feature worth mentioning in more detail is the simulated synthetic matte finish ebony and ivory key tops that are on the keys. This proprietary material that Kawai uses on their keys not only gives the the keys a more classy appearance and cuts down on the glare that plastic keys can sometimes give off, but this synthetic material feel smooth and organic making you believe that your fingers are touching the "real thing" when they are really not. 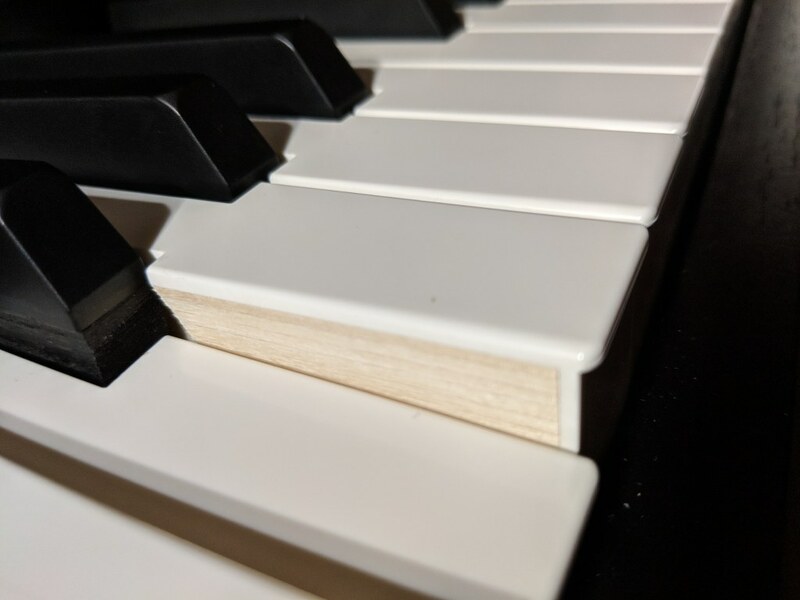 In decades past, acoustic pianos had real ivory and real ebony on their key-tops for better finger traction, better absorption of sweat from the fingers, and smoother finger movement. 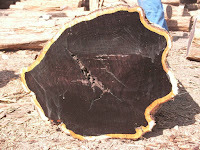 However, ivory and ebony are organic materials from elephants and trees. Since harvesting ivory from elephants is illegal and the same is true for ebony which come from specialized trees which can take from 60 years to 200 years for one tree to grow and mature. 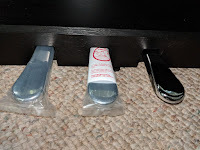 So because these materials are no longer available to use in piano key actions such as what is in digital pianos, some of the digital piano companies have synthetic versions of these materials and now use it on their keys to give you the impression you are touching the real thing. The Kawai simulated proprietary ebony and ivory material that is used not only feels great but is arguably the best and most authentic of any digital piano manufacturer using these synthetic types of material on their pianos. 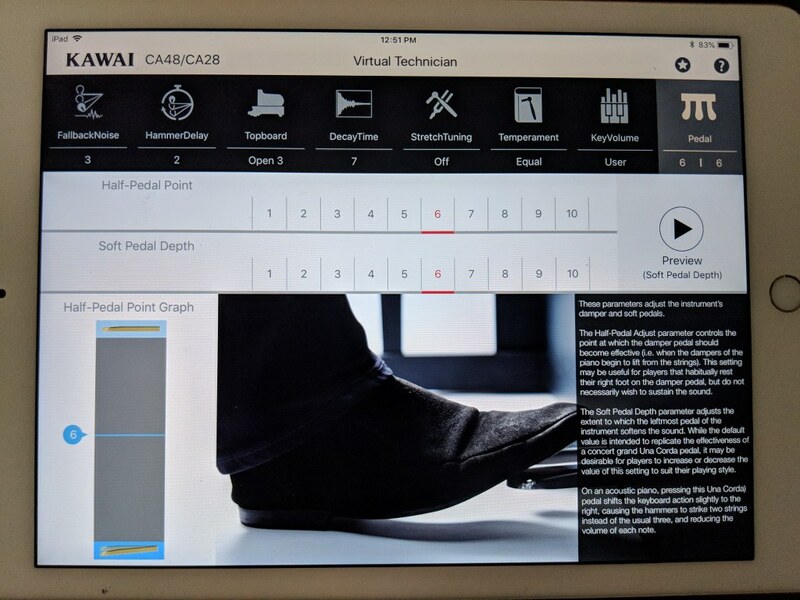 So when it comes to even these key action details, the Kawai company is doing an outstanding job in my opinion on this new model. When it comes to key actions in this price range or any price range, it's somewhat of a balancing act for these piano companies to try to create a key action that plays really good but at the same time is quiet when the keys are moving up & down. In a real acoustic piano piano those key actions are generally fairly noisy when moving up and down because there are a lot of mechanical parts moving around and making noise. The reason most people are not bothered by that noise or don't hear the noise is because acoustic pianos are always so loud. There is no volume control on a real acoustic pianos so they are either loud or louder...that's how I describe it because I play them, own them, and have been around them all my life. 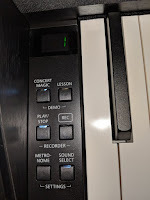 A big advantage to digital pianos is that there is a master volume control so that you can play at a low softer volume. Also, there is a headphone jack so that you can practice in privacy without anyone hearing you which for some people is a really good thing. When playing more quietly or with headphones in a digital piano, some of these key actions can be a bit noisy when the keys are moving. 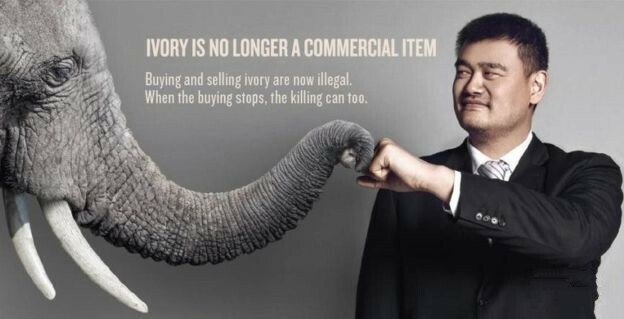 For most people this will not be an issue because there is always some noise in key actions. But for other people who are more sensitive to noise when the keys are moving, then you will be happy to know that based on all my playing time with the Kawai CA48, I can tell you that this Grand Feel Compact key action is very quiet when the keys are going both down and up, especially as compared to other digital piano brands and models. 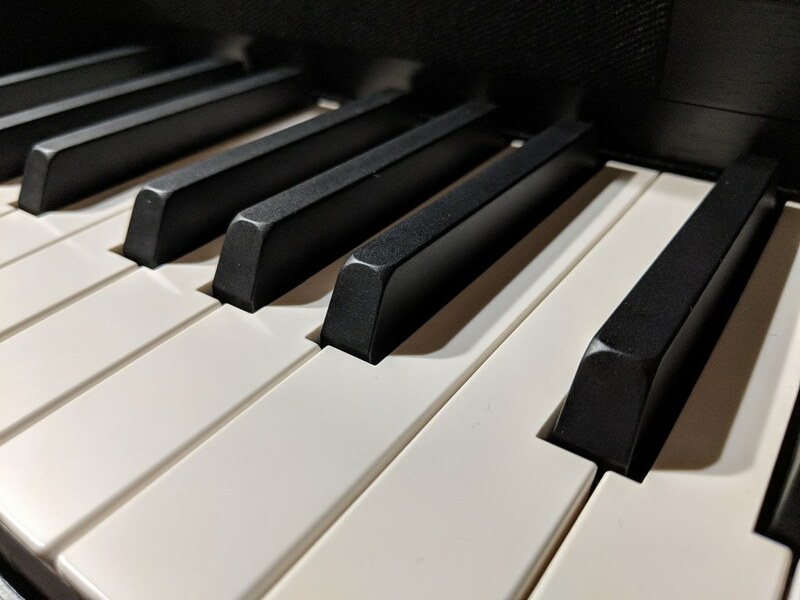 Sometimes keys can be noisy when pressing them down and other pianos can have noisy keys when the keys are coming back up or even noticeably noisy in both directions. With regard to the CA48, the key movement is quiet although it is not silent. There will always be some ambient noise with something mechanical (like a piano key action) is moving. But in comparison to all other digital pianos I have played under priced $3000, Kawai does an outstanding job in eliminating most key noise while still offering expressive, nicely weighted keys that feel great, look great, and operate well. 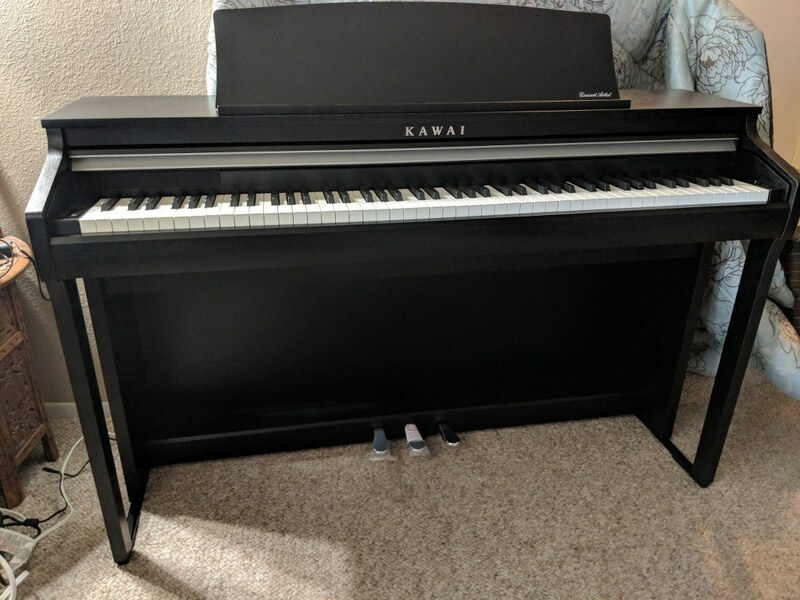 With regard to piano sound authenticity, the Kawai CA48 has a 192-note polyphony stereo piano sound chip (which is more than enough of piano processing power even when layering another sound)) which offers 2 distinct piano sampled recordings from 2 completely different Kawai acoustic grand pianos, one being more mellow and the other being more resonate and metallic with a fuller sound. There are also other acoustic piano sounds available on this model totaling 8 piano sounds. I do like the tonal dynamics of the main piano sampled recordings which are improved from older Kawai models with wider tone which really allows for good expression on this model because expression not only includes volume changes as you play the keys softer or harder, but the musical expression includes a change of tone from more mellow to becoming brighter and more "alive" as you press the keys harder and harder. 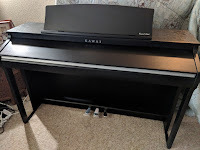 So I do like the fact that the Kawai piano sounds allow for noticeably natural piano dynamics and musical expression so that whether you are a student or accomplish piano player, you will appreciate what you can do with the pianos sounds on the CA48. 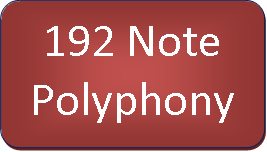 The 192-note polyphony piano chip means that you'll likely never run out of piano note processing power which is important so that you don't have what people call "note-dropout" which can happen if the piano processor can't handle a large amount of stereo piano notes played simultaneously along using the sustain pedal and even layering an additional instrument sound with the piano sound. The CA48 does quite nicely in this area. 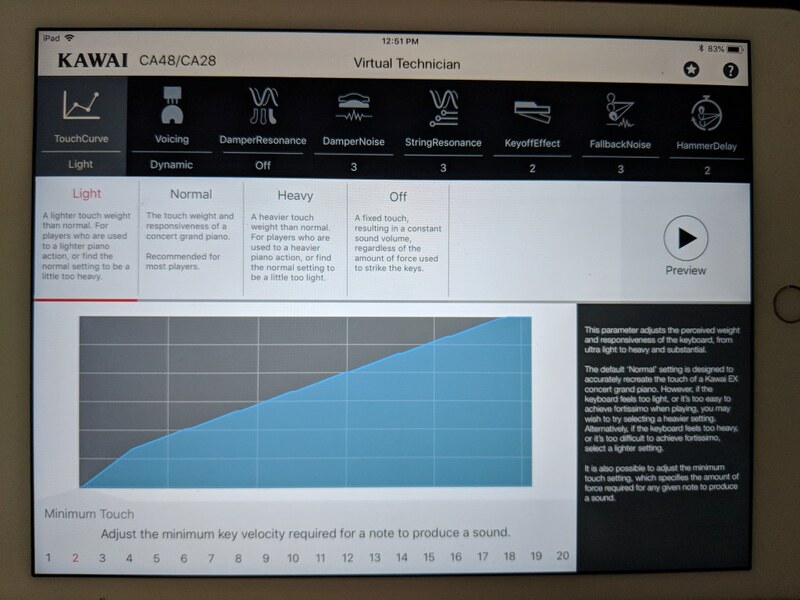 If that weren't enough as far as the piano sound goes, Kawai also has a proprietary iOS app (iPad, iPhone) for their digital pianos called Virtual Technician which allows the user to modify and edit the different piano sounds on the CA48 in a way that customizes the sound for your ears as opposed to what other people may like. For instance, if you wanted to change key velocity touch response, you can do this from the app so that you can make the piano sound respond differently if your particular finger touch is hard, or soft, or in-between. Some people do not have much strength in their fingers or maybe they pound on the keys with their fingers hard and are not subtle enough. By changing the key touch sensitivity in the piano you can make it so the piano comes in more quickly and loudly or comes in less quickly and loudly when striking the keys with your fingers. When you make a change for that function then it changes all 88-keys. 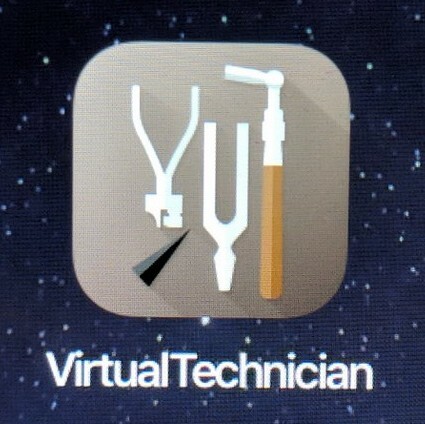 going even further with the key touch sensitivity, the Virtual Technician app also offers "individual key volume" change rather than changing touch and volume for all keys at once. For instance, maybe your ears are sensitive to one or two particular notes on the 88 keys that seem to be a little too loud or too soft in volume for your ears, especially as compared to the notes around them. 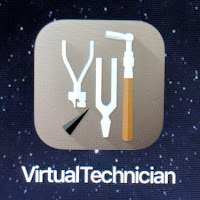 The Virtual Technician app allows the user to instantly and easily change the volume of just one, two, three, etc notes either louder or softer while all the other notes stay the same and that change can be saved as a new preset setting within internal app memory so you can have it that way or use another setting instead. 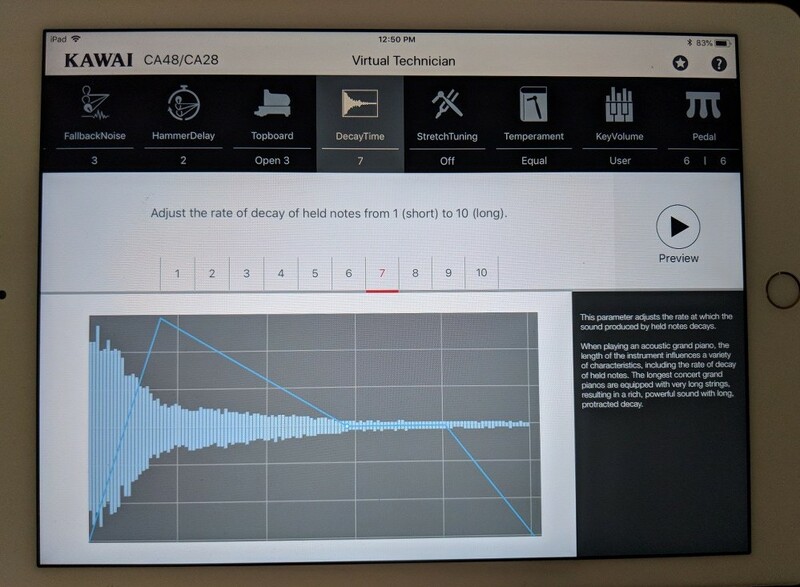 What I am saying is that the CA48 can be customized in a variety of ways including changing pedal resonance, dynamic tone, pedal sustain rate, hammer noise, stretch tuning mode, and so much more for people who like technology, have an iOS device, and who may want to customize the piano sound for their own personal tastes besides what Kawai already has built into this piano. You can even have your customer setting be stored in the piano and come up as a default setting when the piano is powered on. There are no other digital piano brands I know of which offers this kind of control over the piano sounds in an all-wood key key action for this price range. 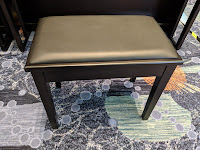 When it comes to shopping for a new furniture cabinet digital piano, one of the things that people sometimes overlook is the 3 pedals attached to the front bottom of the piano. What I mean by "overlook" is that many people just think pedals are pretty much all the same on various digital pianos. That's like saying the piano key action is the same or the piano sound is pretty much the same among many different digital pianos. Well nothing could be further from the truth when it comes to pedals and what they do and how they feel. The 3 pedals include (from right to left) damper/sustain, sostenuto, and soft. The soft pedal does what its name suggests and that is when you are holding down that pedal, what ever note or notes you are playing will be heard at a softer volume. The soft pedal allows you to reduce volume on notes you are playing to make for more expression and feeling when you are playing a song. It allows you soften a note in that way whenever you want to or when the piece calls for it. That pedal is used more often in classical music than other types of music but for most people playing music at a beginning through intermediate recreational level, I find that the soft pedal is (overall) not used very often. The middle pedal is there to sustain (hold) a specific note or notes at any given time while all the other notes have no sustain and would be heard as staccato (short) notes. This pedal is used almost exclusively for classical music and in reality is seldom used any more by people playing at a recreational level. The right pedal is for sustaining any notes that would be played at any given time. This allows for the piano notes to be held for a short to longer period of time to add beauty and fullness to the sound and allow for resonances and richness of tone to occur and is used in all kinds of music by beginners through professional players. The damper/sustain pedal makes your music sound great and actually can help you sound better than you really are as well! The CA48 does a great job with all three pedals and I was very impressed with the responsiveness of the pedals, especially sustain-decay time of the piano notes when using the sustain pedal. In other words, the longer it takes for the piano sound to fade out when holding down the pedal while playing a note or notes, the better and more realistic the piano sound will be...like that of a real acoustic piano. The CA48 had long sustain times across the keys in the lower octave range to the upper octave range. Beyond that, the damper/sustain pedal also triggered "damper resonance" which means that in a real piano when you hold the right side damper pedal down then the strings can create more natural resonances giving you a very organic natural reverberation which is especially noticeable in the upper octaves of the keyboard. 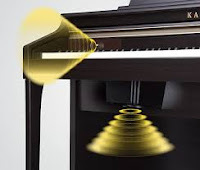 This is something that naturally occurs in all acoustic pianos, but in digital pianos it either is not there or if it is there is is not very noticeable. In the CA48 I found that the damper resonance effect was quite real and added a lot of ambiance to the music which gives it an added organic element that I noticed right away and was very pleased to hear it. The extra resonance came in when it was supposed to and responded like I would expect on a real acoustic piano. The physical weight and resistance of all 3 pedals was very good and had a natural grand piano pedal feel to it with a firmer amount of weight so that when you pushed down the pedals it did not feel like those light-weight keyboard type pedals or lightweight toy-like pedals I have felt on other digital pianos. Not only that, but the pedals were fairly quiet when pressing down on them or when the pedals were coming back up. Although there is some mechanical noise associated with pedals on a real acoustic upright or grand piano, keeping this noise at a minimum is especially important on a digital piano because when playing a digital piano at a lower volume or with headphones the last thing you (or someone else in the room) wants to hear is noisy pedals making clunking sounds like I have heard on many other digital pianos. So when it comes to the 3 pedals and what they do and how they work, in my opinion Kawai has done an excellent jog with this aspect of the piano. As far as the other non-acoustic piano instrument sounds go, there are 11 of them including some impressive electric pianos, choirs, organs, strings, synthesizers, harpsichords, etc which you can access off the control panel by pushing the sound-function button and pressing a specific white or black key on the piano. Those sounds are very good and much better than on other brands of digital pianos I have played in this price range. I also like the fact that those sounds not only sound great by themselves, but they also make the acoustic piano tones sound even fuller when you layer any of them together with an acoustic piano sound or even layer 2 non-acoustic piano sounds together. So whether you layer acoustic piano & strings, organ & choir, acoustic piano & vintage electric piano, acoustic piano and synthesizer bells (called Atmosphere), or harpsichord & slow strings, the overall quality of those sound combinations are really great in my opinion having played them all with a variety of combinations. Whatever adds to the musical enjoyment when I play a digital piano is what I look for and this piano really does it good. There is a small LED display screen on the control panel to the left of the keyboard which will display what feature/function you are selecting. However when it comes to these instrument sounds and how they are displayed in the LED screen, there is just a number in it showing sound #1, #2, #3 and so on. You would normally need to memorize what that sound is to know what the number means. For some of the other functions (reverb, transpose, touch, etc) there is an abbreviation of that feature so it's a bit easier to understand what you are selecting, but it's not completely satisfying. Also, with the control panel being on the far left side of the piano, depending on the lighting in your room, that area of the piano and the 6 buttons on that panel can get quite dark and therefore the buttons and the names of those buttons become very difficult to see. When there is light shining directly over that control panel then there is no problem, but that isn't always the case. It would have been much better if Kawai had designed the button titles/names as being displayed with LED lights over them so you could more easily tell one button from the next, or even see those buttons at all. So having a well lit are so the control panel is more easily seen is a good idea unless you won't be using those other buttons very often that control other features of the piano. There is a solution to finding the sounds you want in the CA48 directly on the piano and doing it more quickly. Kawai gives you two very innovative ways to more easily identify the sound and function you are using as well as to control them more intuitively including layering two sounds together at the same time. One of those sound identification functions is called Vocal Assist. The way this feature works is that when you touch and hold the sound select button and then touch specific keys on the keyboard, there is a voice in the piano that verbally tells you what function or sound you are getting when you press that key. For instance, when you press the 1st white key in the bass section, you are triggering the SK concert grand piano sound. The voice (sounds like a lady with a British accent) says "SK Concert Grand" so you can audibly hear what sound or feature you have selected. 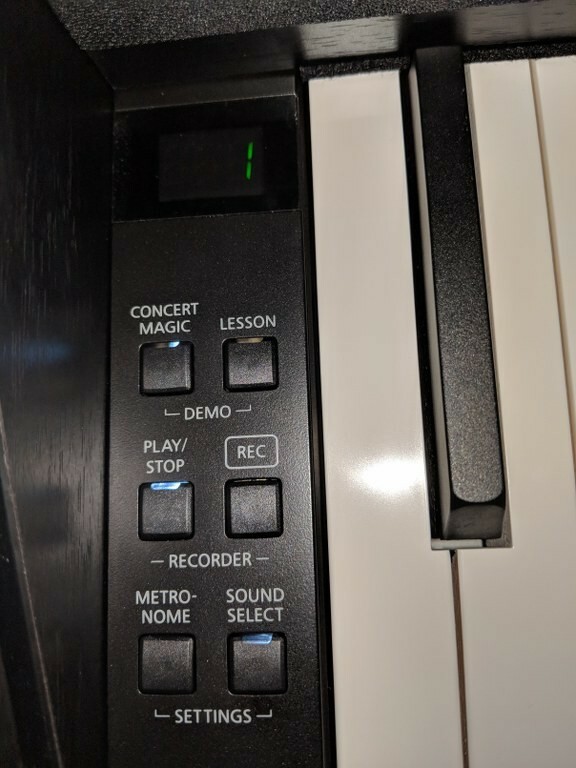 If you press the 2nd white key then the voice says "EX Concert Grand." 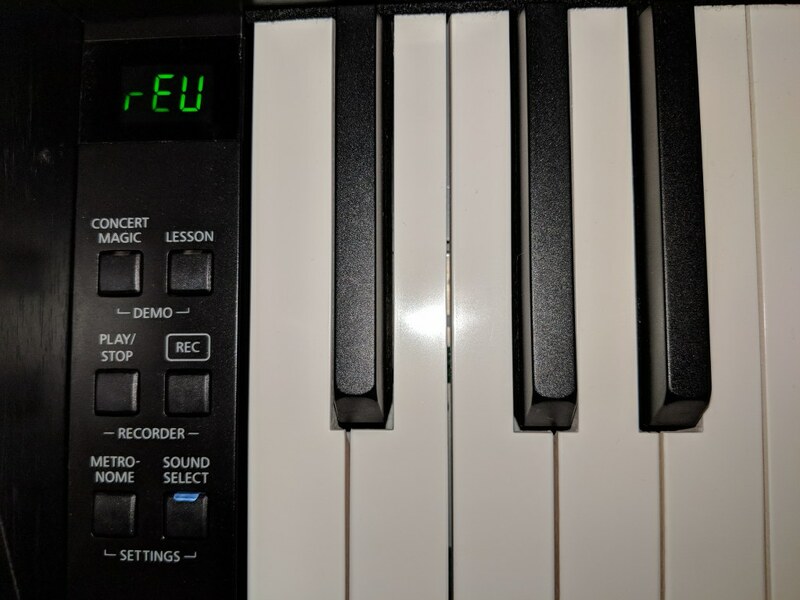 If you press the 3rd C key from the bottom then the voice says "Room Reverb," and if you press the 3rd D key the voice says ""Lounge Reverb," and so on. Beyond the voice assist, the piano also has a feature called Sound Preview which plays a short musical run of notes of the exact sound you have selected b y pressing a key on the keyboard so you hear the sound as well and hear a voice that says what the sound is. You can disable the Vocal Assist control and the Sound Preview "run of notes" control so that there is no sound when you activate a new function or sound by pressing a specific key and the sound select button at the same time. These features are very helpful for the sight impaired person who needs help identifying what function or sound they have selected or want to select. 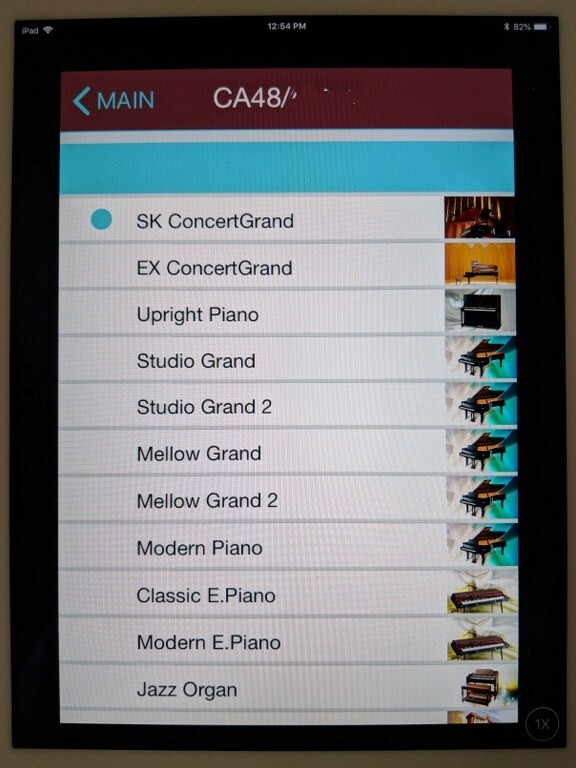 The CA48 can also use a proprietary app that Kawai created to make instrument sound selection even easier and more fun for a few different digital piano models including this one, and that app is called Sound Museum. 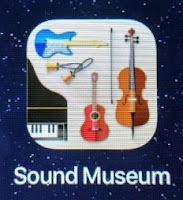 The Sound Museum app only works with iOS products such as iPhone or iPad and does not work with Android products...sorry Android users! 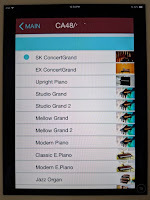 But this is typical with many other useful apps out there in the digital piano world. The Sound Museum app visually lets you see a list of instrument sounds in your device color touch screen that reside within the CA48 and an intuitive easy-to-use interface that quickly lets you select the sounds you want to hear. The app also allows you to layer any two sounds together and even control the relative volume between those two sounds. Its a very cool app and makes using the CA48 even easier and more fun to use. 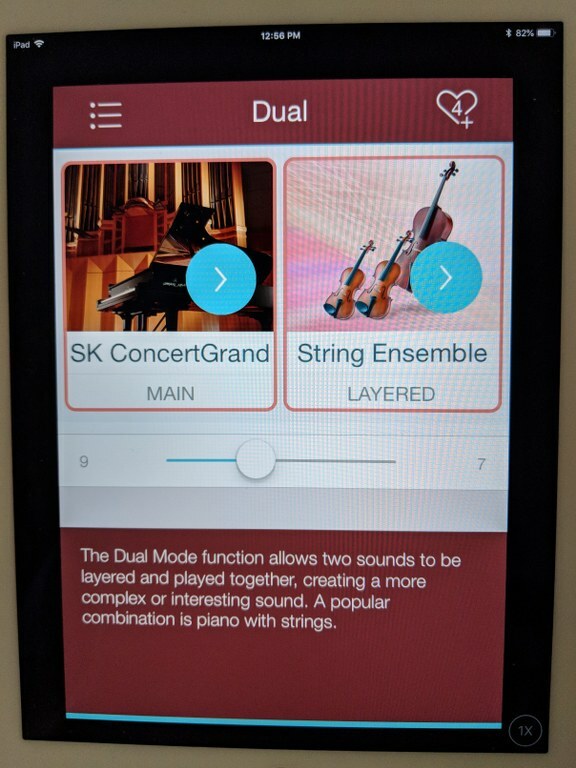 Although the app does not allow control over some of the other functions in the piano, it does the main things that most people care about which are accessing and changing the instrument sounds as well as layering them together. Also in the app, there is a section where you can save your favorite instrument sounds and layered sounds so that you can instantly access them in the "favorites section." The Sound Museum app is also great for audibly impaired people who cannot hear or don't want to use the CA48 function/key way of selecting a sound(s). So whether you want to select a piano sound, harpsichord sound, synth sound, organ sound or you want to layer any 2 sounds together, with pictures of the instruments and the name of the instruments in front of you in the app, using the CA48 to access these things is really a breeze...as long as you have an iOS device as I mentioned earlier. 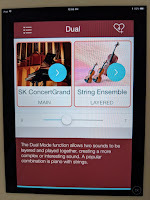 The Kawai apps do not work with Android devices so that is a downside and Kawai unfortunately does not plan to include Andoid devices for these proprietary apps...but I have seen other digital piano companies do the same things for their apps as well. 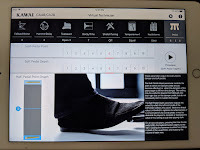 When you want to connect your external device (such as an iPad) to the CA48 and you want to use interactive MIDI controllable apps such as Sound Museum or Virtual Technician, the Kawai CA48 has a Bluetooth wireless feature that allows you to connect your device to the CA48 without the need of a cable. 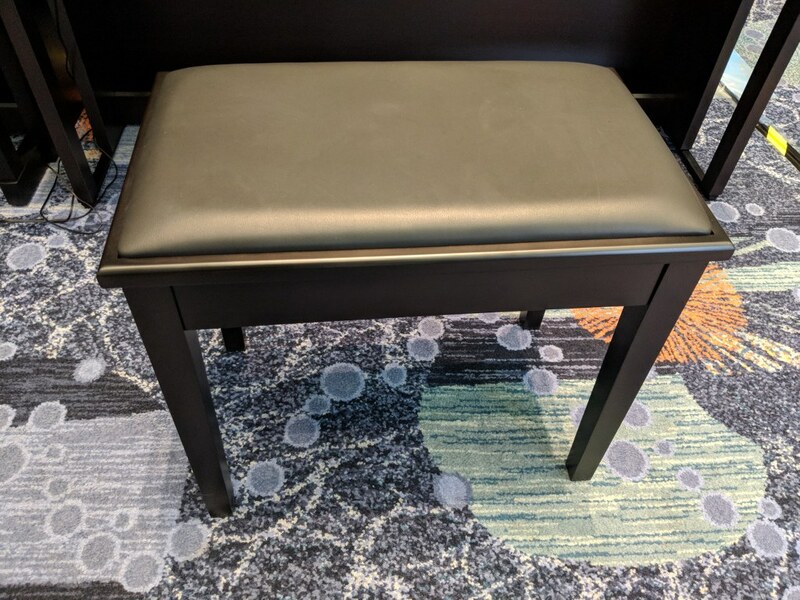 This pretty cool because the connectivity is nearly instant and then you can put your iPad (or iPhone) wherever you want to and have control over the piano wirelessly and anywhere in the room you want to. 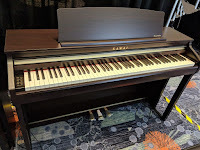 Also there are many 3rd party music/piano educational apps for learning how to play the piano in the comfort of your own home and those apps can also be connected by Bluetooth wireless MIDI because the CA48 has that feature. There are some 3rd party education and instrument sound apps that work for both iOS and Android devices so that's a good thing.There is only one drawback when using apps and that is the audio sound of that app (assuming it has music or some type of audio sounds in it) will not be heard through the piano. 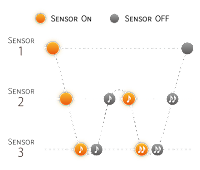 So you would need to find another source to send the app audio to such as an external speaker system connected to your device directly to hear audio from your phone, tablet, or computer because otherwise the internal music and sounds in the apps would only come through the device speakers which as generally not meant for good quality sound. Although having direct audio streaming through the piano speakers would have nice, that is something I can live with given what the piano is otherwise capable of doing. 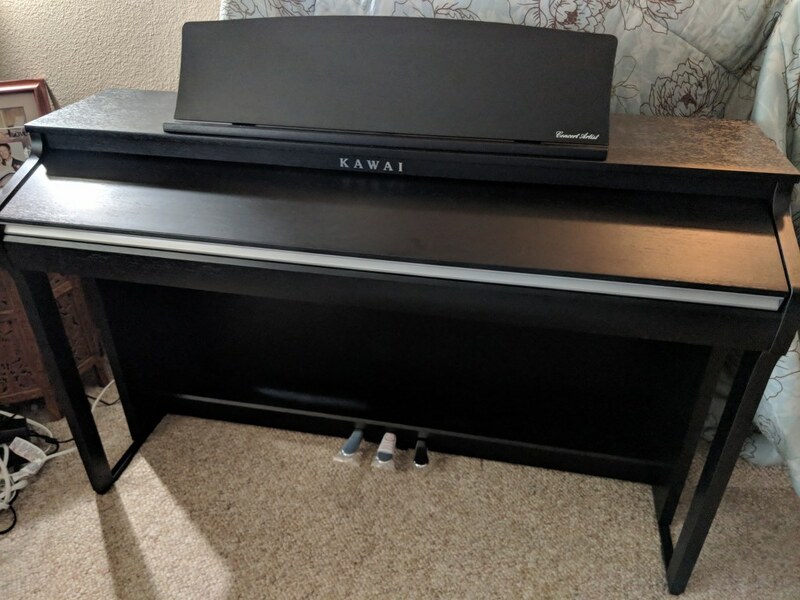 The Kawai CA48 has a number of interesting and useful digital features such as layering/mixing 2 different instrument sounds together which can make the over sound experience more dramatic and musically exciting. It has a four-hand mode where two people can practice the same song at the same time playing the same notes by converting the keyboard electronically to 2 separate 44-note keyboards that act independent of one another. There is a digital metronome which is fully adjustable for tempo and time signature which is great for students and learning to stay "on the beat." 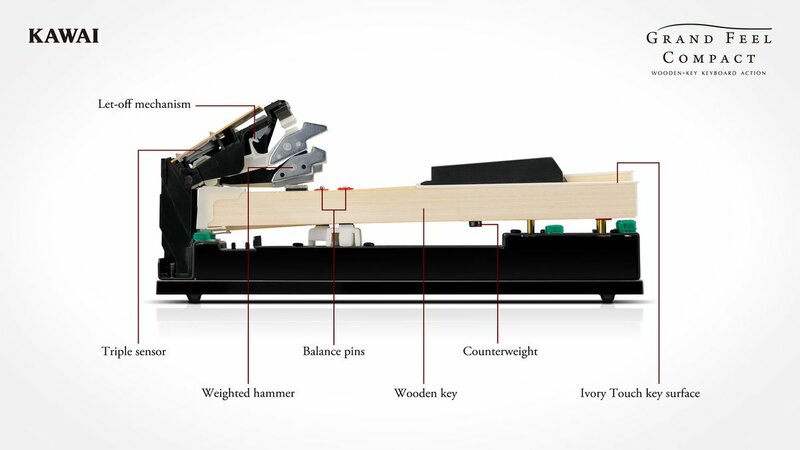 There are also functions in this piano that allow you to adjust the overall tonal quality of the sound which include reverb (adding a variety of reverberation to the sound), brilliance which allows for brightening up the sound or reducing brightness so the sound is more mellow, and touch sensitivity control which allows you to change the touch to harder, softer, or medium so that when you play the keys the piano sound will come in more quickly for people who play more lightly (less finger pressure) or harder for people who have a harder touch from their fingers, and the harder setting reduces the initial attack volume so that a person with harder finger pressure won't overpower the key volume. You can also record songs on the CA48 using the piano control panel and then playback to listen to how you are doing. The recording feature has just one track recording for both hands instead of 2-tracks so that you could record and playback right and left hand independently as you can on other digital pianos. I would have preferred a 2-track recorder/playback system but for many people a 1-track recorder playback feature can be enough. You can also save up to 3 recordings in memory so you can retrieve and playback those recorded songs whenever you choose to do that. If you want to record more songs then you have to erase what was previously in the recorder and then you can record new songs. Also included inside this piano is a library of piano lesson songs based on the Alfred piano curriculum along with a few other more advanced piano lesson songs from other lesson methods, all totaling 5 different books of songs. This is useful and fun when combined with the actual lesson books (not included with piano) from these popular publishers that many piano teachers use. Then you can read the lesson and see the song notation while hearing it play in the CA48. You can slow down or speed up tempo while learning and even separate playback of right and left hand parts. This a a really cool feature and can also help with "ear training" along with keeping it more enjoyable when you are playing along. 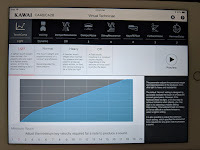 Hearing these lesson songs from the lesson books also helps give the student a better understanding of how the individual songs should go and the library of built-in songs within the CA48 is very good given the fact that no other digital piano brand near this price range offers a feature like this one. A few other useful functions in this model would include a transpose feature allowing you to digitally change the key you are in without you having to learn the song in a new key which you may not be able to do based on your musical ability. Transpose is a great feature in allowing the player to modulate the song up or down (churches do that a lot with their music) and it's also very useful if you or someone is singing along with you and you need to get the song into your vocal range so then you use the transpose feature to do that and it works well for that purpose. With regard to using headphones for private practice, the CA48 even has specific digital features to make that experience more realistic such as Spatial Headphone sound which electronically changes the sound position in your headphones which gives you the feeling the sound is coming out in a more natural way. The CA48 also has a function which optimizes your headphones so that the headphones sound more natural depending on the type of headphones you have such as "open," "semi-open,"closed," "in-ear," etc. 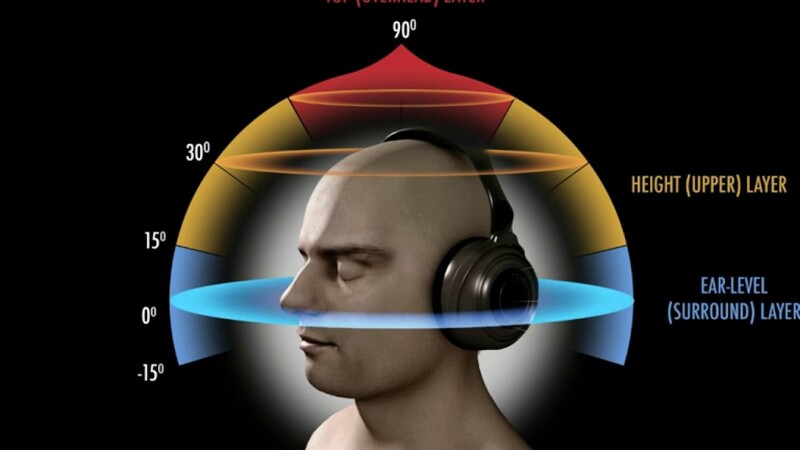 This feature really does work and adds to the overall stereo headphone listening experience for those people who take advantage of what headphones can do for you when it comes to private practice so no-one else can hear you. 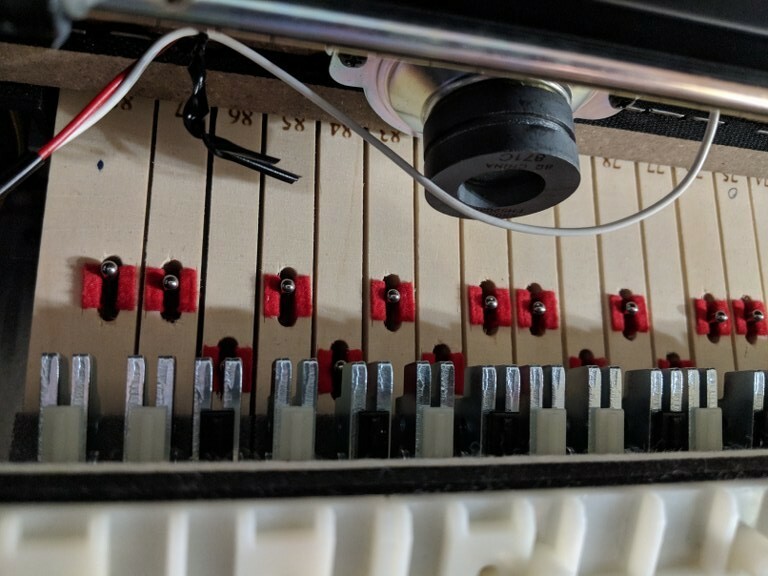 Finally, when it comes to useful features, the CA48 has a start-up mode which allows you to save/store some of your custom settings that you've done which you may want to have all the time when you first power up the piano. These start-up settings would include a specific sound, reverb, sound combination, metronome beat, Virtual Technician settings, etc. I tend to use this start-up function if the piano model offers it so I find this a very useful thing to have. 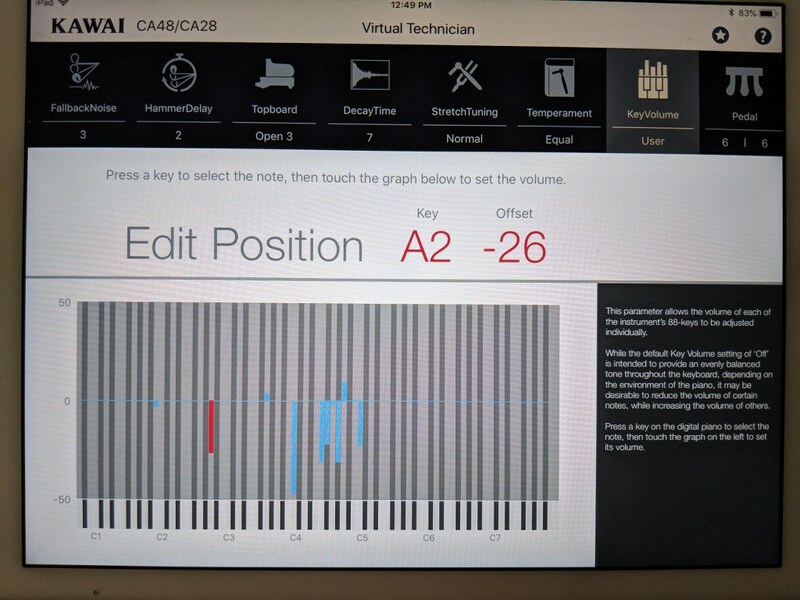 The Kawai CA48 offers other useful features like I have just mentioned but this should give you an idea of some of the cool things it's able to do. It's definitely worth mentioning that for a number of years, on certain digital piano models, Kawai has included a special proprietary fun education learning system for beginner students and for people who may play the piano but just want to have some added musical enjoyment. This unique system is called Concert Magic it is designed to let you play familiar songs that are built into the CA48, but in a way that allows for extensive rhythm and timing training while not having to play the correct notes for the songs to sound good. In the basic learning mode the student, even at very young ages, can play any key and get the correct left hand chord and right hand note of the chosen song...all by pressing one note at a time. The point is to press the key(s) in a steady constant beat beat without having to worry about playing the right note or even at the right time. When you can play any note on the keyboard in a constant fashion and have the song sound correct and be recognizable (hearing both left and right hand notes come out in the one key you are pressing, then that encourages you to want to play more because it sounds so good! You can also learn to play the key in the correct rhythm time so that it (the beat) comes out correctly and still not have to know the actual notes yet. This takes a bit of getting used to, but once you do its great fun and it makes even 3 year old children sound great and is fun for the entire family to hear. There are 40 different well known songs from different eras and music categories within the Concert Magic Music Library along with different modes of learning including Easy Beat, Melody Play, and Skillful. I have played with this Concert Magic feature a number of times and I always have fun doing it. So whether you are an adult or child beginner or a more advanced piano player like me, I guarantee you'll have great fun using the Concert Magic system and you'll be especially impressed in how interactive you can be with the song library in making you sound great while you learn the fundamentals of rhythm & timing in a way that no other digital piano brand can do. I will say that not everyone will want or need to use this feature, especially if you are purchasing the piano to play in a normal way and you already know how to play. 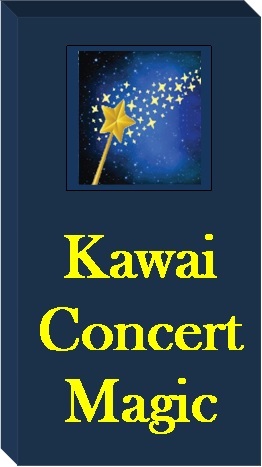 But for many people, especially children, I believe you'll enjoy this Concert Magic feature quite a bit. We're now getting into the "home stretch" so I will say a few things about the internal speaker system of the CA48. There a 4 speakers in this model with 2 speakers measuring 5.12" each at the bottom of the piano (1 on each side) pointing down to the floor, and there are also 2 smaller "tweeter speakers" measuring 2" each pointing forward from inside the piano above the keys one on each side of the piano. The amplification system has 40 watts total (2x20w) of stereo power, so for most rooms the CA48 puts out plenty of volume. However, I personally would have preferred more power out of this piano (perhaps 60 watts for the main speakers) and even another couple of amplifiers powering the tweeter speakers independently of the main speakers. But most digital pianos in this price range only have 2 speakers and 2 amplifiers built in. 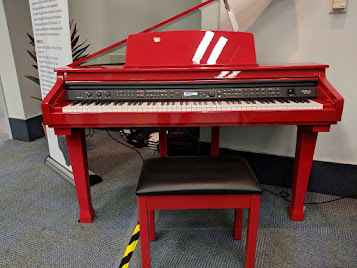 I love a piano with a huge, bold sound and even though the CA48 volume and tone will be fine for many applications, their are other digital pianos with more power and more amplifiers, but many are in a higher price range. Also, the CA48 does not have separate audio outputs so you cannot connect this model to an external audio system. So unfortunately, this piano needs to be free-standing in that way. If you are looking to get this model for your church, school, or another venue that is looking for bigger sound and volume, then you may need to consider another piano with more built-in power or built-in audio outputs. It's too bad Kawai did not include audio outputs in this model because that would have been an inexpensive solution to this issue. But for the most part this piano will go into people's homes or small venues and it should do a good job of filling up most spaces with plenty of sound all by itself, especially if you turn up the master volume to full. 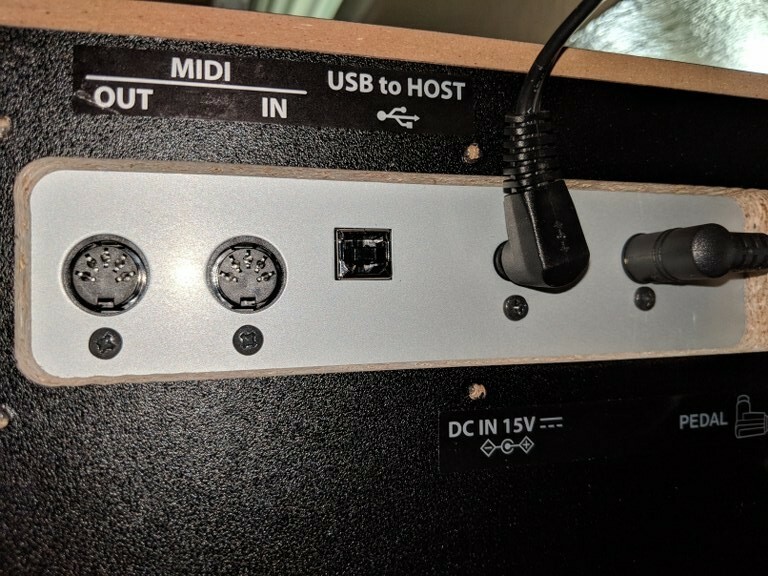 With regard to external and/or internal connectivity, the CA48 has 2 MIDI ports which supports traditional MIDI plugs and those MIDI ports can also be adapted to an external Bluetooth Audio adapter so that the piano could receive Bluetooth wireless audio through its speaker system. 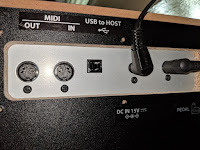 The CA48 does not have audio outputs or inputs but it does have a USB output to host so that you can plug in your computer or device to access programs or apps. 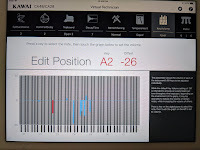 However, with the on-board Bluetooth wireless MIDI protocol, you don't need a cable connected to your device and piano to access MIDI responsive apps and programs so this makes it very quick & easy to connect your iPad (as an example) to the piano so that you can instantly use apps such as the Kawai Virtual Technician and Sound Museum as I discussed earlier. This kind of connectivity works well and does the job and there are many digital pianos in this price range and for less money that do not have this feature. Finally, this model has 2 stereo headphones jacks including a mini-jack and a standard 1/4" jack both both types of connections. Having two headphone jacks also allows for two people to play together privately without disturbing other people in or around the immediate area. When you add it all up for its relatively low price, the CA48 in dark rosewood ($2099 internet discount price) or in the satin (matte) black finish with simulated black wood-grain ($2199 internet discount price) is a real winner in my opinion. 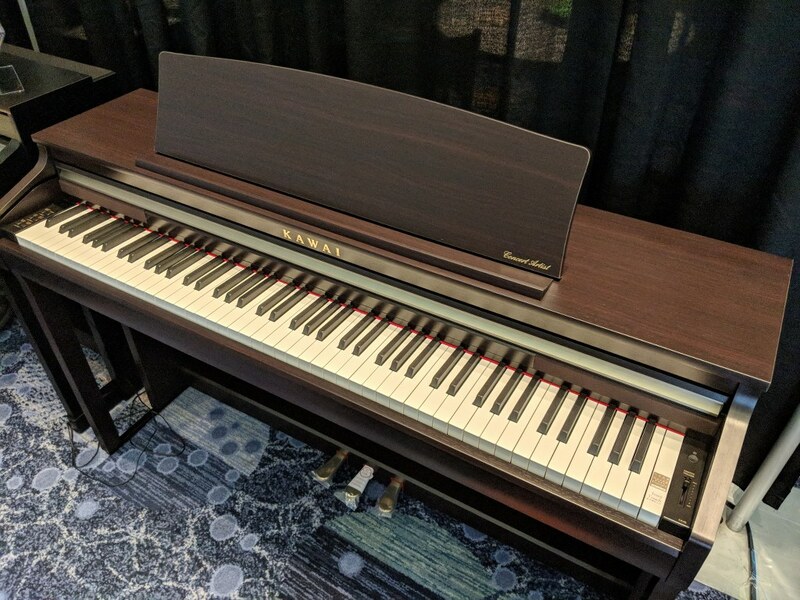 Although there are always a few short-comings in most any new digital piano out there in my opinion including the CA48, this impressive model has enough great features and functions to make a digital piano shopper say "yes" I want that one! Measuring in at just 53"x18"x33" and weighing only 125lbs, this model can easily fit into a lot of places. It looks very attractive with a nice cabinet design along with front support legs, a privacy panel below the keyboard, a slide-out key cover, an adjustable music rack with lots of space to put your sheet music or music books, 3 attractive chrome pedals on the black cabinet and brass pedals on the rosewood cabinet, and a comfortable padded matching bench that has music storage inside, in my opinion the new CA48 offers the type of features, functions, cabinet design, and price that most people want who are looking to mainly purchase a digital piano that focuses on the piano playing experience rather than offering all kinds of bells & whistles such as drums, brass, woodwinds, auto-accompaniment, multi-track recording, etc that a lot of people just don't want or need.The CA48 is part of the Concert Artist series of digital pianos for Kawai and that lends itself to having a prestigious instrument with that great, dynamic, authentic wood-key key action experience that so many people are looking for in this price range. 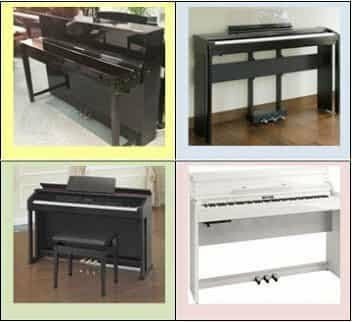 All the other newer current model Kawai furniture cabinet digital pianos around or under $2000 have their plastic key actions. Although those key actions can be enjoyable to play, and I have played them all, they don't come close in touch, feel, movement, or response to the wood-key Grand Feel Compact key action in the new CA48. Also, I really do like the full stereo sampled piano sound coming out of the internal speaker system and through headphones along with the responsive pedaling that I experienced, and because I enjoy using technology to assist me in getting more music out of these digital pianos, I did like the fact that I could quickly and easily get around the CA48 when it came to using the all the instrument sounds and layering through the Sound Museum app on my iPad & iPhone. 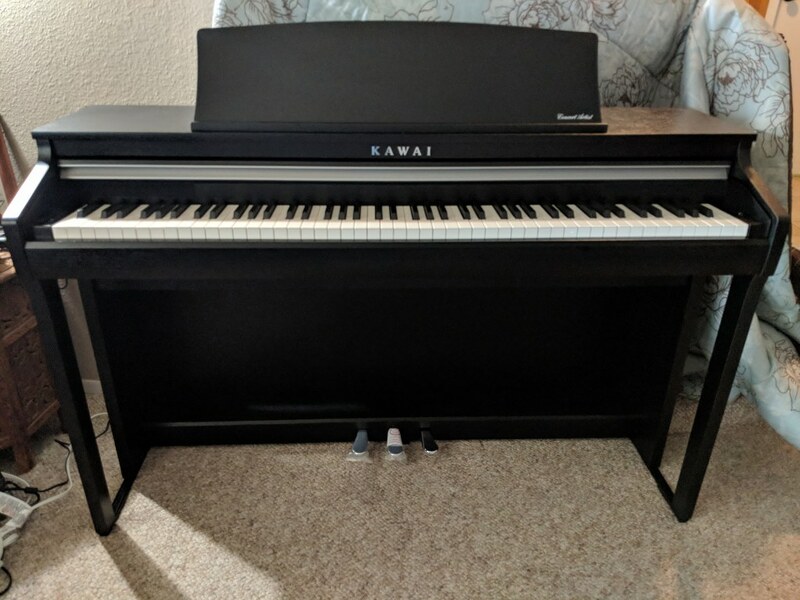 Given the fact that the Kawai digital pianos are known for their overall reliability and durability over time, this piano still comes with a long factory warranty of 5 year parts & 5 years labor with in-home service. 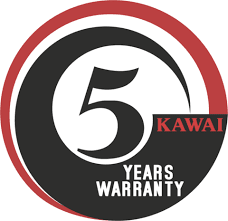 This warranty is a fairly long time in my opinion and covers any factory defect that occurs in the piano, so this 5 years of factory warranty time should give most people peace of mind when it comes to the piano being backed up by a reputable company such as Kawai. Although the CA48 offers some compelling functions and digital features as well as a resonate piano sound, it is really the special proprietary key action that sets this model apart form all the rest. This is not say that a person cannot enjoy playing and owning a new Casio AP650, or new Yamaha YDP184, or new Roland HP601, or new Korg G1 Air as examples, because those pianos can be very enjoyable to play as well and they are all in a similar price range except for the Korg coming in at lower price-point for $1599. 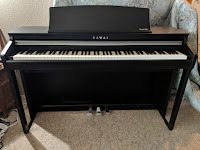 I do really like and recommend the Kawai CA48 for all the reasons I talked about here in this review because at the end of the day it just depends on what your musical goals are, your piano playing experience is, and what type of budget you have. With all that in mind the Kawai CA48 Concert Artist model may just be the perfect piano for you!